Sometimes I feel like I am living in a pressure cooker. There is only so much time in the day and only certain things can be done while kids are asleep/occupied. 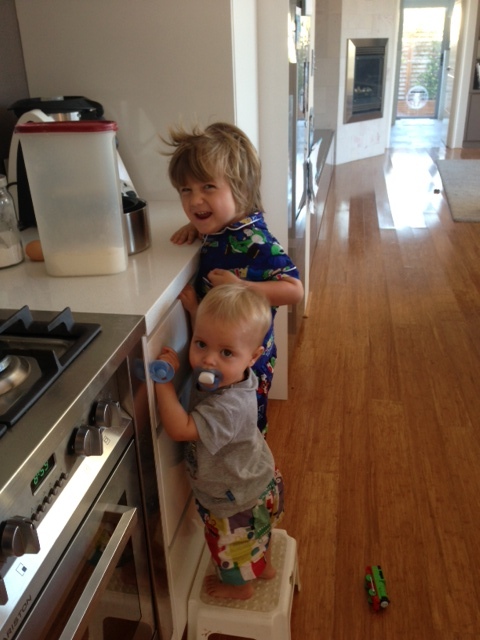 There are no guarantees that they will sleep for prescribed number of hours or play by themselves for more than minutes at a time….and so I race, heart pumping, through my to-do list, dreading the cry announcing that Leo is awake or the pitter-patter of Julian’s impatient little feet. Yesterday while Leo was asleep I did a load of washing, hung it out and brought in the stuff on the line which I then folded. I did a load of dishes and cleaned up the kitchen. As soon as that was done I peeled potatoes and chopped veges for dinner, then cleaned the kitchen quickly again. Julian was content to build towers and cubbies so he was being an angel. Just as I had my foot on the stairs to go take a much needed shower, Leo cried. Damn it. I felt like a contestant in a game show and the buzzer had gone off. Game over. So my shower was with Leo, who gets in and out at whim, wobbling naked from shower to bed, dripping over wood floors and pulling down crystal lamps in his wake. I get the soap out of my eyes and drip over the floor myself, to drag him back in, and the process begins all over again. I needed to dry my hair as I was going out, so I do this one handed, Leo in the other arm so the destruction of my bedroom doesn’t continue. So I have come up with a new plan. I’m going to take ten. The first ten minutes of the kids sleep/self-play time are for me. I have to prioritise what is most important to me and stop putting my needs last. If I had done that yesterday I could have had a peaceful shower by myself. I would have then had to contend with Leo climbing into the dishwasher as I stacked or crawl through the dog door to get me as I hung out the washing…but life’s not perfect! Do you have strategies for getting things done without getting frazzled? That so sounds like me! I am alwayy putting off that shower and getting ready, I’ll just do this and then this and then bam toddler is awake or its school drop off time already or something else and I have no time left and I am like oh not, another 30 second shower with my toddler and leaving the house looking dishevelled! Excellent…I am inspired that you are inspired! I so hear you! I don’t take 10 I take 30!!! That’s if I get any time with both asleep…My baby is 10 weeks and I have a 2yo and I have found it VERY hard to get a groove going, my house is destroyed, laundry all over place etc. There is nothing worsethan trying to get a whole heap done around the house and the very second you sit down one of them wakes up, Love the contestant analogy! All in the same boat – swimming around in our houses alone thinking it’s just us! !